FREMONT, Calif. — A few years ago, Silicon Valley start-ups like Solyndra, Nanosolar and MiaSolé dreamed of transforming the economics of solar power by reinventing the technology used to make solar panels and deeply cutting the cost of production. Founded by veterans of the Valley’s chip and hard-drive industries, these companies attracted billions of dollars in venture capital investment on the hope that their advanced “thin film” technology would make them the Intels and Apples of the global solar industry. But as the companies finally begin mass production — Solyndra just flipped the switch on a $733 million factory here last month — they are finding that the economics of the industry have already been transformed — by the Chinese. Chinese manufacturers, heavily subsidized by their own government and relying on vast economies of scale, have helped send the price of conventional solar panels plunging and grabbed market share far more quickly than anyone anticipated. As a result, the California companies, once so confident that they could outmaneuver the competition, are scrambling to retool their strategies and find niches in which they can thrive. The challenges come despite extensive public and private support for the Silicon Valley companies. 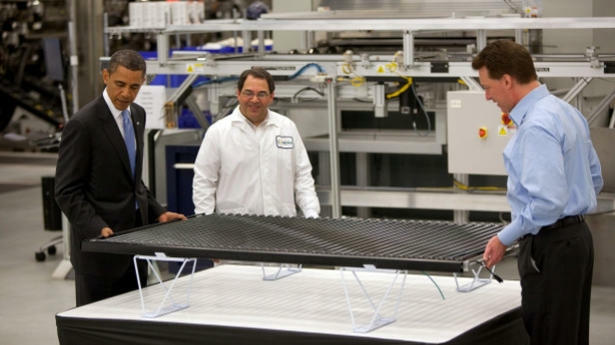 Solyndra, one of the biggest firms, has raised more than $1 billion from investors. The federal government provided a $535 million loan guarantee for the company’s new robot-run, 300,000-square-foot solar panel factory, known as Fab 2. “The true engine of economic growth will always be companies like Solyndra,” President Obama said in May during an appearance at the then-unfinished factory. But during the year that Solyndra’s plant was under construction, competition from the Chinese helped drive the price of solar modules down 40 percent. Solyndra rushed to start cranking out panels on Sept. 13, two months ahead of schedule, and it has increased marketing efforts to make the case to customers that Solyndra’s more expensive panels are cost-effective when installation charges are factored in. To be sure, Silicon Valley companies like Solyndra, Nanosolar and MiaSolé continue to receive hundreds of millions of dollars in customer orders and some plan to expand local manufacturing. But the rapid rise of low-cost Chinese manufacturers has made investors — who once envisioned the region’s future as Solar Valley — skittish about backing new capital-intensive start-ups. In the third quarter of 2010, venture capital investment in solar companies plummeted to $144 million from $451 million in the year-ago quarter, according to the Cleantech Group, a San Francisco research firm. The paucity of capital and the sheer size of Chinese solar panel makers have proved particularly problematic for companies like Solyndra and MiaSolé, which make photovoltaic cells using a material called copper indium gallium selenide, or CIGS. Unlike conventional solar cells, which are made from silicon wafers, CIGS cells can be deposited on glass or flexible materials, much as ink is printed on rolls of newspaper. Though the technology is less efficient at converting sunlight into electricity, the promise of “thin film” solar cells was that they could be made cheaply. However, producing CIGS cells on a mass scale has turned out to be a formidable technological challenge, requiring the invention of specialized manufacturing equipment. While Silicon Valley companies were working on the problem, silicon prices fell and Chinese companies like JA Solar, Suntech and Yingli Green Energy rapidly expanded production of conventional solar panels, supported by tens of billions of dollars in inexpensive credit from the Chinese government as well as other subsidies like cheap land. Arno Harris, chief executive of Recurrent Energy, a San Francisco solar developer acquired by Sharp last month, said he chose to sign a supply deal with Yingli because the Chinese company offered low prices, quality products and financing. Chinese solar panel makers now supply about 40 percent of the California market, the largest in the United States, and the bulk of the European market, according to Bloomberg New Energy Finance, a research and consulting firm. By comparison, Solyndra expects to have a total production capacity of 300 megawatts by the end of 2011. The competition from the Chinese has prompted some Silicon Valley companies, like AQT Solar, to pursue new strategies to survive. Silicon Valley in the Internet age has not made for great presidential photo ops. The Valley’s computer-chip factories were off-shored decades ago and (Google excepted) the software giants that supplanted hardware companies just didn’t have the same pizzazz — T-shirted geeks writing code can’t compete with guys and gals in bunny suits tending big futuristic machines. The rise of green tech has changed all that. The Valley is back in the business of building stuff — solar panels, electric cars, fuel cells, and various energy efficient widgets and gadgets. And so when President Obama’s helicopter landed Wednesday morning at Solyndra, a solar module maker, a television-ready tableau awaited — a huge American flag hung in an unfinished factory, shiny high-tech thin-film solar panels were on display and workers in hard hats mingled with an audience of some 200 engineers, scientists, venture capitalists, and California’s patron saint of green tech PR events, Governor Arnold Schwarzenegger. “We’ve got to go back to making things. We’ve got to go back to exports. We’ve got to go back to innovation,” said Obama on Wednesday in Fremont as Solyndra employees snapped photos with their iPhones. It’s an apt choice of words, for the fortunes of green tech startups like Solyndra have become entwined with the government as the Obama administration attempts to jumpstart a transition to a clean energy economy. The sprawling solar module plant we’re standing in — its construction is employing 3,000 workers — is being financed thanks in large part to a $535 million loan guarantee the Department of Energy granted to Solyndra last year. Solyndra, a well-financed solar module maker, filed a registration statement for an initial public offering on Friday to raise $300 million to expand its manufacturing capacity. It would be the biggest solar-related offering in years and follows the stock-market debut of the electric car battery-maker A123 Systems in September. Based in Fremont, Calif., Solyndra emerged from stealth mode in October 2008 having secured $600 million in venture financing and $1.2 billion in orders. The company, founded in 2005 by veterans of the chip equipment maker Applied Materials, has since raised nearly $200 million more in venture funds. The company makes cylindrical thin-film solar modules designed for commercial rooftops. The round modules collect sunlight from all angles, allowing the solar panels to be placed horizontally and packed close together, increasing efficiency and lowering installation costs, according to Solyndra. Solyndra secured a $535 million loan guarantee from the United States Department of Energy in March to help finance the construction of a second factory near its headquarters. In September, the company applied for an additional government loan guarantee to help pay for the second phase of the $1.38 billion factory, according to the registration statement. It’s been a good news, bad news Friday for the solar industry. Silicon Valley startup Solyndra received a half billion-dollar loan guarantee from the U.S. Department of Energy to build a solar module factory while further up Interstate 880 OptiSolar moved to shut down its manufacturing operations. OptiSolar too had asked for a federal loan guarantee to complete work on its Sacramento thin-film solar cell plant but a decision on the $300 million application couldn’t come soon enough to save the startup. “We continued to be unable to find a buyer for the technology and manufacuring business, and the board of directors decided that we needed to limit ongoing operational expense,” wrote OptiSolar spokesman Alan Bernheimer in an e-mail. First reported by the San Francisco Chronicle’s David Baker, OptiSolar will shut down factories in Sacramento and Hayward, Calif., and lay off 200 workers. Earlier this month, OptiSolar sold its pipeline of solar power plants – including a 550-megawatt solar farm that will supply electricity to PG&E (PCG) – to rival First Solar in a $400 million stock deal. 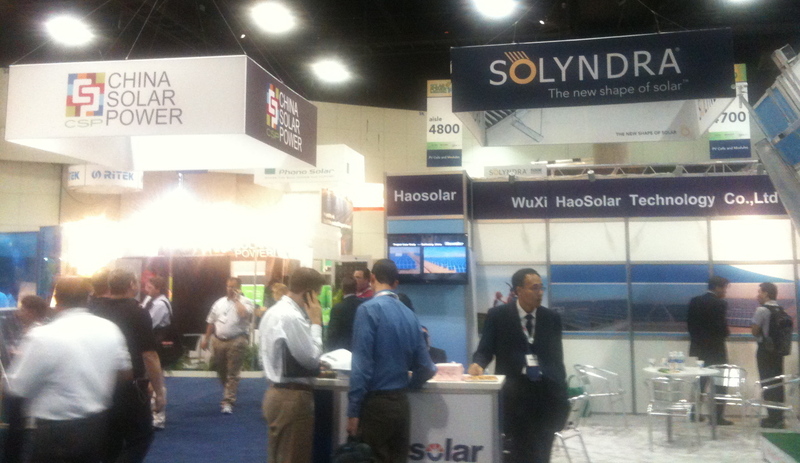 At the time, OptiSolar said it intended to focus on manufacturing solar modules. The news was definitely brighter Friday for Solyndra, which emerged from stealth mode last September with $600 million in funding and $1.2 billion in orders for its solar panels composed of cylindrical tubes imprinted with solar cells. Conventional rooftop solar panels must be tilted to absorb direct sunlight as they aren’t efficient at producing electricity from diffuse light. But the round Solyndra module collects sunlight from all angles, including rays reflected from rooftops. That allows the modules, 40 to a panel, to sit flat and packed tightly together on commercial rooftops, maximizing the amount of space for power production. The $535 million federal loan guarantee will allow the Fremont, Calif.-based company to build a second factory, which is expected to create 3,000 construction jobs and more than 1,000 other jobs once the plant is in operation. The factory will be able to produce 500 megawatts’ worth of solar panels a year. Friday’s grant makes good on Secretary of Energy Steven Chu’s pledge to speed up processing of renewable energy loan guarantee applications. The department had come under fire during the previous administration for taking years to dole out grants and loan guarantees for electric car and green energy projects. Meanwhile, First Solar (FSLR) announced on Friday that it had manufactured 1 gigawatt of thin-film solar cells since beginning commercial production in 2002. It took the Tempe, Ariz., company six years to hit 500 megawatts and only eight months to produce the second 500 megawatts. First Solar’s annual production capacity will reach 1 gigawatt by year’s end, according to the company.